THE EXPANDED STAK-O-WAX "PICTURE SLEEVE GUIDE - 3rd EDITION"
...is simply the most complete reference ever available anywhere on singles released in America from the beginning (1949) up through the end of 2008. This 5 Volume reference now contains 5,550+ discographies. 4,800+ pages, and weighs more than twenty pounds.! LIST OF ALL LABEL DISCOGRAPHIES IN THE 2009 EDITION OF "THE DIRECTORY"
"THE DIRECTORY" began in the early 70's as a small collection of individual artist and label discographies, and has grown and evolved into its present form by a series of supplements, additions, reprints, etc. The brand new 2009 35th Anniversary Edition consolidates all of the supplements, additions and corrections of the past into the new 5 Volume edition. 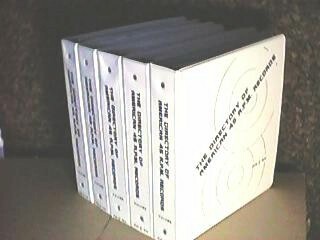 FIRST-TIME BUYERS: The price of the complete 2009 5-volume set is $290.00 + $20 S&H in the US, or $115 International S&H. It includes everything listed below except the Re-Issue and Picture Sleeve Supplements, which are available separately at $22.50 each. OLD CUSTOMERS!! Find out what the cost would be to totally update your older copy of "THE DIRECTORY". If you bought an earlier edition and we lost track of you because you moved, click on the "old-timer" below. In 2000, we introduced a brand new Volume 5 to the 4-Volume "DIRECTORY OF AMERICAN 45 R.P.M. RECORDS". It included 1,522 never before available label discographies, including many of the small independent labels. The response to the smaller labels was so terrific that we assembled the old research gang and started digging some more. The result was so not only thousands of additions to those labels, but the addition of over 1,120 label discographies not included previously. This brand new (and most likely the last) revision adds another 1,350+ labels, bringing the total, just in Volume 5, to over 3,900 labels. This works out to about a nickel a piece for all 5,500+ labels in the 5-Volume set!! The New Revised Volume 5 has 862 pages (316 more than the 2004 Volume 5). This revised Volume 5 is available separately, and is part of the 5-Volume set if you are a 1st-time buyer of "THE DIRECTORY". This ADDITIONS/CORRECTIONS SUPPLEMENT for Volumes 1-4, the first in four years, contains 240 pages of new additions and corrections and replacement pages for active labels, updating "THE DIRECTORY" so that it now covers 60 years of the little record with the big hole - from 1949 through the end of 2008. Thousands of new listings. PICTURE SLEEVE GUIDE - 3RD EDITION"
Lists all known 45-RPM picture sleeves, both alphabetically by label and by artist. With the help of many collectors and researchers, all of the "phantom" sleeves seen in other guides, are not listed in this guide. The new 3rd Edition now lists 15,550 US Singles Sleeves (NO EP'S). This is 4,500 more picture sleeves than any other publication, and 1,550 more sleeves than our 2005 Edition of The Picture Sleeve Guide. RE-ISSUE SUPPLEMENT TO "THE DIRECTORY"
Offered briefly in the late 70's until the printer lost the negatives! Recently found and expanded to include later releases, this 173-page supplement includes reissue-only labels like Lost Nite, Collectables, Bim Bam Boom, Eric, Flashback, Oldies 45, Radio Avtive Gold, Relic, etc., and also includes the reissue series of labels, such as the Columbia Hall of Fame Series, Capitol Starline, Elektra Spun Gold, U.A. Silver Spotlight Series, etc. Over 80 different labels in all. We have not offered individual discograpies for sale since 1978. Because of so many requests, we are again making them available. Now you can order any discography in the directory individually. Prices are listed below. Email us and we will let you know how many pages are the discographies you request. There are about 150 releases listed per page. Price includes US Postage. Out of US - postage added. CLICK HERE FOR THE COMPLETE LIST OF THE 5,550+ INDIVIDUAL DISCOGRAPHIES AVAILABLE. Due to the 2013 jump in US postage, we have adjusted our rates on International shipments.